Meredith, Don H.. "Dogsledding". The Canadian Encyclopedia, 31 January 2019, Historica Canada. https://www.thecanadianencyclopedia.ca/en/article/dog-sledding. Accessed 24 April 2019. 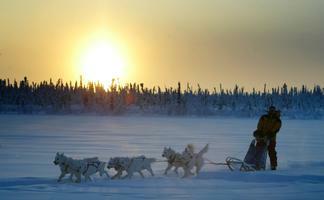 Dogsledding is a method of winter travel developed by northern Indigenous peoples. Early European explorers and trappers adopted it as the most efficient way to haul goods across snow-covered terrain. 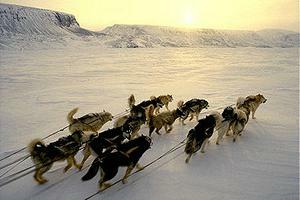 Dogsledding is a method of winter travel developed by northern Indigenous peoples. Early European explorers and trappers adopted it as the most efficient way to haul goods across snow-covered terrain. Teams of two to 12 or more dogs are commonly tied in pairs to a single towline, or gangline. The gangline is attached to a sled, and the dogs pull the sled across the snow. When crossing trackless terrain in deep snow, dogs may be placed in single file between two towlines to follow the driver, who breaks a narrow trail in snowshoes. In the Arctic where the snow is packed hard, Inuit often use the "fan hitch” where each dog is attached to the sled by its own towline. The first one or two dogs on a gangline are the leaders and guide the team. The “point dogs,” the first pair behind the leaders, encourage the leaders forward and are often leaders-in-training. The “wheel dogs,” the last pair of dogs immediately in front of the sled, are usually the strongest dogs and keep the sled on track. The dogs between the point and wheel dogs are the “swing dogs” and keep the team on the trail when rounding. The leaders are controlled by voice commands from the driver, who either rides the rear of the sled or walks ahead, or runs behind. Early French Canadian drivers called "Marche!" to spur their teams. English explorers misinterpreted this as "mush" — henceforth drivers were called "mushers." Husky tied to a packed, two-piece Inuit dog sled (courtesy Canada Science and Technology Museum/CN Collection/CN005614). The runners of the sled, or komatik, were iced with spit to reduce friction (artwork by Gordon Miller). Sleds vary with the people who make them and the snow conditions. In the Arctic the Inuit developed the heavy "qamutik," designed to carry loads over rough terrain. Farther south, people made the flat-bottomed toboggan to haul loads through deep snow. Europeans modified these designs and developed the basket sled with its load raised off the snow and supported by two narrow runners for hauling over packed trails. Modern dog-sled drivers have shortened and modified the basket sled for racing. Sled dog breeds were originally developed by northern Indigenous people thousands of years ago. Wolves were domesticated to help with hunting and their progeny were bred to develop dogs that could haul loads, either in packs on their backs or by pulling a sled. The Mahlemut people of northwest Alaska developed one of the earliest breeds that have survived to this day, the Alaskan Malamute, a large dog with a heavy coat of fur and powerful legs. The Inuit in northern Canada developed the Canadian Inuit (Eskimo) Dog, smaller than the malamute, but built for hauling heavy loads over hard-packed snow. Today, both of these breeds are registered purebreds with the Canadian Kennel Club. 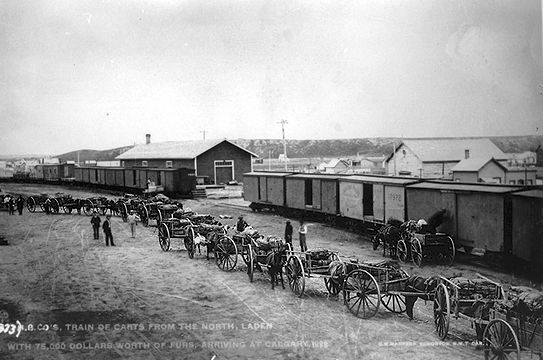 During the fur trade and the gold rushes of the 19th and early 20th centuries in northwest Canada and Alaska, dogs were brought (often stolen) from the south to supply the demand for freighting dogs. Some of the bigger dogs were bred with malamutes and other Indigenous sled dogs to produce the mixed-breed Mackenzie River Husky, a large freighting dog with heavy fur and long powerful legs for pulling through deep snow. When dogsled races became popular in the 20th century, dogs were bred more for speed than freighting abilities. The purebred Siberian Husky was imported from Russia because of its smaller size and speed as a racing dog. It was crossed with other breeds of racing dogs, such as greyhounds, to develop the mixed-breed Alaskan Husky. Some Alaskans are bred for all-out speed in sprint races, others to endure multi-day, long-distance races. Although the airplane, automobile and snowmobile have largely replaced the traditional roles of dog teams, dogsledding has become a popular winter sport. Sled dog enthusiasts train teams for a variety of activities from touring wilderness areas to racing for fun and cash prizes. Races are held across Canada, often in association with winter carnivals. Some are short distance races or sprints, where speed is the key to winning. Others are endurance races covering many hundreds of kilometres and several days of travel. The most famous endurance race in Canada is the Yukon Quest, which runs each year between Fairbanks, Alaska and Whitehorse, Yukon. The race is 1,600 km long, taking 10 to 14 days to complete, depending on trail and weather conditions. In Alaska, the Iditarod dogsled race covers a similar distance between Anchorage and Nome, Alaska. Races also occur in many countries around the world, including the northern United States, Greenland, France, Norway and Russia. L. Coppinger, The World of Sled Dogs (1977).